This is not a precise recipe, more of a jumping off point for you to make these eggs however you want. I recently received an email from a reader asking what vegetables I use for the scrambles. The answer? Whatever vegetables I happen to find at the market that are good for roasting! Since it’s winter time, it’s been a lot of cauliflower and squashes mixed with potatoes and onions. I’m sure when summer rolls around the mix will be different. I have to say, the cauliflower and butternut squash have been my favorites. One quick note: the reason that this is such a fast and easy dinner option is because I already have the vegetables roasted and sitting in the fridge. 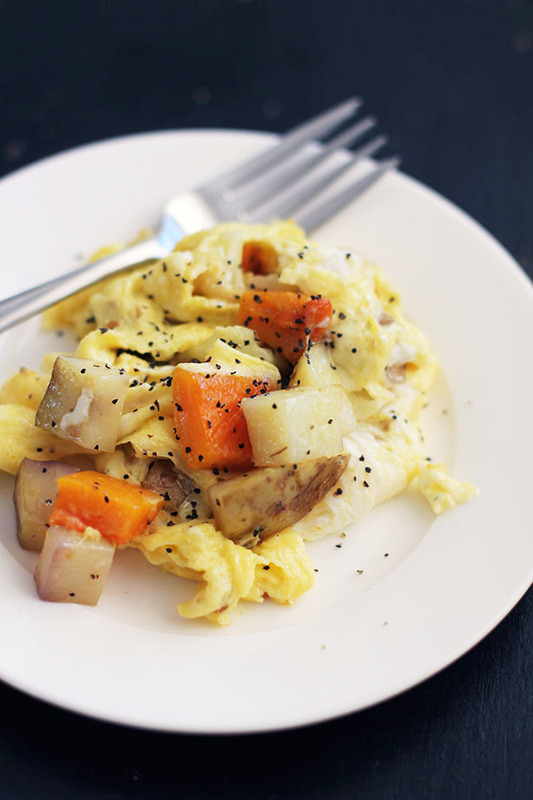 I have yet to actually roast vegetables simply to make these eggs. Although, they are delicious enough to be worthy of the effort. BUT…the reason this is my new go-to dinner is because those veggies are sitting there waiting for me. I didn’t use to be a person who roasted vegetables every week, but now that I do, well, I love it. It really is wonderful having them on hand all the time, I highly recommend it! Heat a small frying pan on the stove over medium heat. Once the pan has been heating up for a few minutes, add the butter and roasted vegetables. Stir occasionally as they heat up. Whisk the two eggs with the salt (my rule of thumb is 2 pinches of salt per egg, so if you're cooking more than 2 eggs, just add more pinches accordingly). Note: this recipe is for one serving, but you can easily up the amount of eggs and vegetables and just cook them in a larger pan. Works great! Once the vegetables are heated through, pour the egg into the pan. 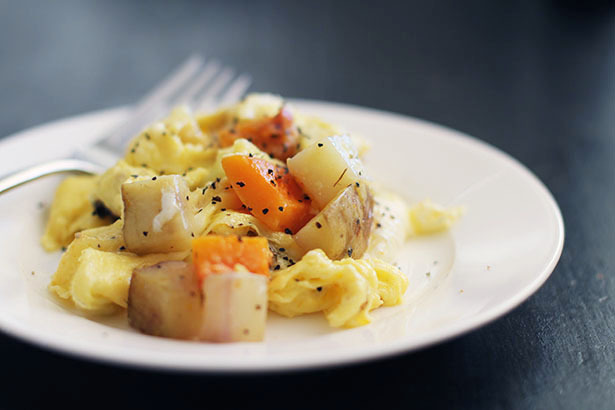 Let cook for about a minute, then start to "flip" the eggs, turning the eggs and veggies over in the pan evenly. Cook until all the egg is just cooked through, making sure not too cook too long. 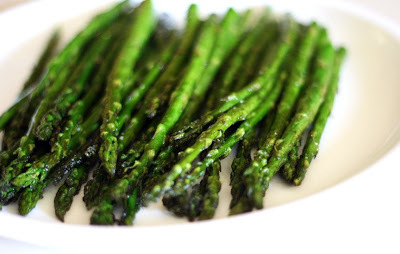 Slide onto a plate, sprinkle with black pepper and enjoy! Click here for an article I recently wrote about roasting vegetables. 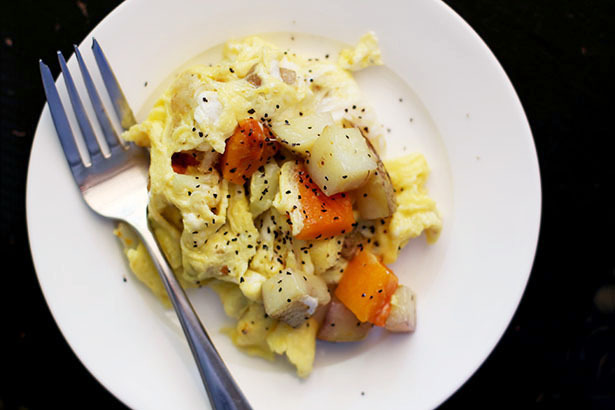 For these eggs, you can roast just 1 or 2 veggies or a large assortment. There are no rules here! Vegetables that I like to roast that I think are good in the eggs: always a bit of yellow onion, cauliflower, potatoes, carrots, squashes, broccoli, green beans, tomatoes, bell peppers, mushrooms, the list goes on!